What is my air conditioning? You air condition does more than just keeping the inside of your car cool. When working properly, your air condition helps to filter out pollen, pollutants and any airborne bacteria that may be present, greatly improving the quality of the air inside your vehicle. Your air conditioning keeps your car cool in the summer and helps to demist your windows in the winter. Even though you may not be using your air conditioning all the time, the system will still have condensation throughout it, and because of engine heat, mould can grow as well as many kinds of bacteria. All of that growing just inches from where you're sitting results in the risk of throat and other infections as well as bad odours in the vehicle. Additionally, the air conditioning filter needs to be cleaned regularly, otherwise it will become blocked and the system will not work properly. Every year you lose a minimum of 10% of your refrigerant gas from the system. It is recommended to get your air con checked every two years. 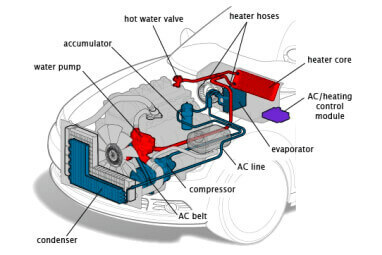 An air con re gas consists of removing the old gas and oil from the system. We then replenish it with the gas and oil recommended by manufacturer's specifications. An air con service includes and air con re gas and more. Not only is your vehicle regassed, a UV dye is inserted into the system to view any future leaks that may occur. We add an antibacterial cleaner, which removes any odours and harmful bacteria build-up. When purchasing an air con service you will be entitled to a discounted fee on your diagnostics if your vehicle is unsuccessful with the regassing. Really friendly and was happy to answer all our questions. Highly recommend people visit.